U.S. 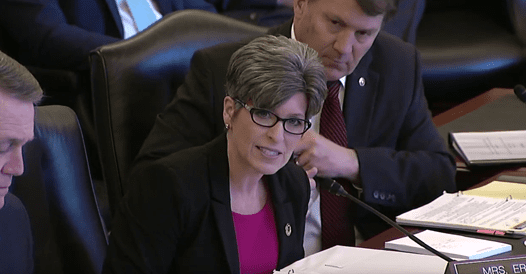 Senator Joni Ernst (R-IA) voted to end the partial government shutdown and secure our southern border. “Today, every senator had the opportunity to vote to immediately reopen the government. The End the Shutdown and Secure the Border Act is a commonsense compromise that would fund critical federal agencies and enhance border security to help curb human trafficking and the transport of illegal weapons and drugs into communities in Iowa, and across the nation,” said Senator Joni Ernst. The End the Shutdown and Secure the Border Act provides investments in border security, specifically supporting all activities and resources outlined in a letter from the Trump Administration. This legislation includes $5.7 billion for construction of a physical barrier along the highest priority locations of the southern border, in addition to providing funding for 750 new border patrol agents and 375 new customs officers as well as counter-drugs and weapons technology and humanitarian needs. Under the End the Shutdown and Secure the Border Act, “provisional protected presence” status will be granted for three years for foreign nationals who grew up in the United States and are enrolled in the Deferred Action for Childhood Arrivals (DACA) program. This three year provisional protected presence will also be granted to certain current Temporary Protected Status (TPS) recipients as well. This package also includes language to reform the way we process in-country asylum claims for Central American minors. Specifically the Act would require a statutory change, along with reallocation of State Department funds, to establish in-country processing capacities at Northern Triangle consulates and embassies in an effort to reduce the incentive for such persons to make the dangerous journey to the United States southern border. State, Foreign Operations and Related Programs.